Ornaments on your windowsills and shelves are pretty enough, but why not make your house all the more special this winter with some bowls of bulbs that are really brimful of colour, perhaps with gorgeous perfume too? You can buy ready-planted bowls of bulbs later in the year, but act now and you could soon have a stunning display at a fraction of the price. The best bulbs are those described as ‘prepared’, which basically means they have been put through a carefully planned sequence of conditions to ensure that they flower well, reliably and uniformly indoors. Prepared bulbs are often a bit pricier but are still great value. You can also use standard bulbs but the results may be unpredictable. I like to use some prepared hyacinths, but just cannot help creating more bowls of non-prepared bulbs too. Visit your local garden centre now and you should see a good array of bulbs for sale, plus all the other things you need. Special bulb bowls are a good buy, and are available in just about every colour imaginable. They’re rather like huge soup bowls, but in plastic or china. Unlike standard pots they have no drainage holes, which is better for your furniture! You can use normal flower pots, but do make sure you put a fully waterproof container or saucer beneath each pot – or watering will prove messy later on. You can use standard multi-purpose compost for indoor bulb displays, but better still buy yourself some bulb fibre or special compost formulated for indoor bulb planting. It’s more expensive than multi-purpose compost, but performs better in bulb bowls or other containers without drainage. 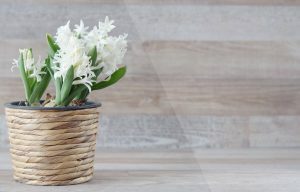 Hyacinths for forcing are available in just about every shade imaginable – red, pink, white, cream, yellow and blue. It is best to use a single colour in any one container as there is often some variation in flowering times between the colours, and ideally you want all the flowers out simultaneously. Specially prepared crocus, paperwhite narcissus and some other daffodil types are also available. If you want to make some seriously low-cost bowls, then do as I do and buy a large bag of inexpensive dwarf narcissus, such as the cheerful, often multi-headed ‘Tete-a-Tete’. They work very well, as do crocuses. Fill your bowl about one third full of compost for larger bulbs to one half full for smaller bulbs. Firm the compost gently, but don’t compact it or the roots of the bulbs will not penetrate it well and you’ll end up with bulbs popping out of the top of the bowl. Position the bulbs pointed end uppermost – you can put them quite close to each other but not so close that they are touching their neighbours, and make sure they are not in contact with the sides of the bowl either. Nestle the bulbs gently into the compost and then top up with compost so that just the noses (the pointed end from which the shoots will appear) are poking out. Water the compost lightly, making sure it is moist but not waterlogged. Then cover the bowls loosely with a black bin liner and put them in a cool, dark place – a cool shed, garage or cupboard under the stairs is ideal. It needs to be both dark and cool or the bulbs will not form good root systems. Check the bowls every week or so and apply a little more water if necessary. It is time to bring the bowls out into the daylight once the shoots are about 2-3cm tall, which usually takes 3-5 weeks. Put them in a cool spot with plenty of natural daylight – a cool but frost-free greenhouse or a spare room window sill for instance. The shoots will continue to grow and develop a healthy green colour; they will now need a little more water. Once the flower buds just start to colour up you can put your bulb bowl in a warmer room, where you will soon be able to enjoy its perfume and good looks. If you want to give the bowl a really smart look, cover the compost with some moss or tie a seasonal ribbon around the bowl. Visit Pippa’s website www.pippagreenwood.com and you’ll find some great gardening items: stylish cloches, tunnels, the fantastic SpeedHoe, plant supports, raised bed kits, Easy-Tunnels, gardening tools, Grower Frames, signed books and more! Or why not book Pippa for a gardening talk at your gardening club?